Gather Together Caption Contest final reminder, Carbonized Matter pricing adjustments, new Optional Items available, a recent Yoshida interview with Mr. Happy, forum post discussion, and fan mail and tweets. Yelta and Rubicon host. 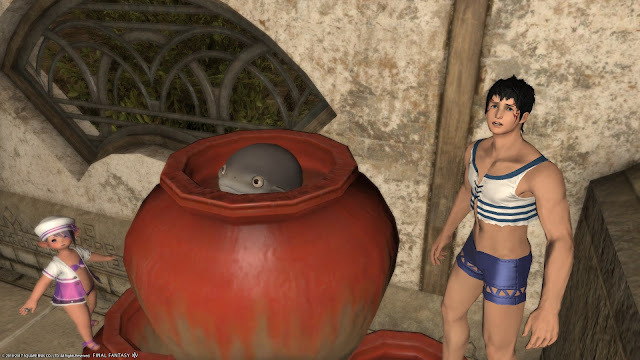 Gather Together Caption Contest reminder, Patch 4.05 impressions and discussion, forum post discussion, fan mail and tweets, and shout-outs. Yelta and Rubicon host. Give us your best caption in the comments section of this post to enter. The winner will receive a full set of the FFXIV Amazon DLC Codes. Contest ends midnight August 1st. Our SPOILER FREE impressions of Stormblood, discussion and analysis of Stormblood story, quests, jobs, and more, Welcome Back to Eorzea Campaign, Fly the Falcon Mount Campaign, shout outs, and fan mail. Yelta and Rubicon host.